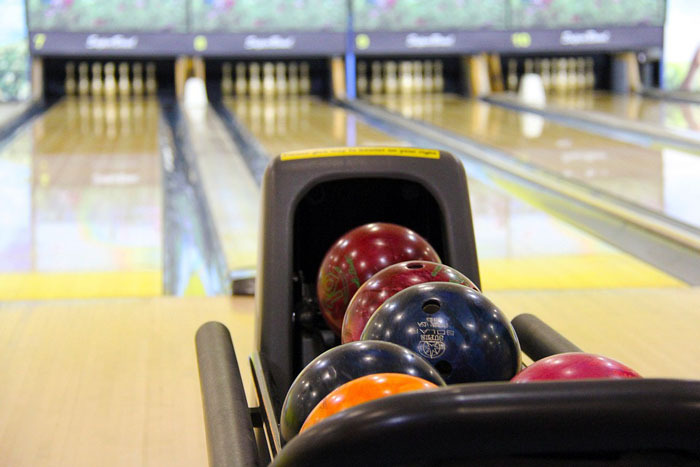 In the 1960s, hard rubber balls were used for bowling. Polyester balls took over as the ball of choice in the '70s. You will find that most of the 'house balls' in your local tenpin bowling alley are made of the polyester. In the '80s the urethane ball was developed, which then were further developed to reactive and proactive urethane. It is not a simple process to create a ball suitable for bowling, there are a lot of regulations that need to be adhered to. Here are the current bowling ball regulations. A bowling ball shall be constructed without voids in its interior, be of a non-metallic composition material and conform to the specifications for weight, size and balance. The use of minute reflective particles or flakes for decorative purposes shall be permitted in bowling ball material provided such flakes or particles are made part of the ball at the time of manufacture, are evenly distributed in a uniform pattern under a transparent shell at least 1/4" beneath the surface of the ball so as to have no effect on the balance, and the total amount of such material does not exceed 1/2 ounce per ball. Also, the surface hardness shall not be less than 72 Durometers "D."
The surface of the ball must be free of all depressions or grooves of specific pattern, except for holes or indentations used for gripping the ball, identification letters and numbers, and incidental chipping or marring caused by wear. The diameter of the ball must be constant. The circumference of a ball shall not be more than 27.002 inches nor less than 26.704 inches, nor shall it weigh more than 16 lbs (there is no minimum weight). Here is a list of the common ball weights. Movable devices are not permitted in a ball except that a device for changing the finger span or size of the finger and thumb holes may be inserted provided it is locked into position during delivery and cannot be removed from the ball without being destroyed. The introduction of metal or any other substance no comparable to the original material used in the manufacture of the ball is prohibited. Plugs may be inserted for the purpose of re-drilling; ball. Designs may be embedded in a ball as guides or for observation or identification purposes provided the designs are flush with the outer surface of the ball. There shall be no interior voids and the plugs or designs must be of similar material to although not exactly the same as the original material out of which the ball was made; and shall otherwise comply with all bowling ball specifications. No foreign material may be placed on the outer surface of the ball. The surface hardness of a bowling ball shall not be less than 72 Durometer 'D'. For information on the number of holes allowed see the ball drilling page. purchase Bowling Balls in the online bowling store. How are bowling balls made? See a video demonstration of the making of a tenpin bowling ball.